Many thanks to everyone who have entered the give-away and provided much valued feedback on the site. I read the comments carefully and will do my best to comply with as many wishes as I can. I hope you’ve already found the interview with Mark interesting in the meantime, with additional personal stories and little sneak peeks into his upcoming works. Even without mentioning it in the comments, I, of course, know that everyone would like to win and this is usually the point where I wish I could send a book out to all of you and I really feel for over 80 people to whom due to limited funds and resources I cannot do so. Please do carry on visiting the site and spreading the word about the contests. Even if you might not enter some of the more difficult contests, such as the art or writing competitions, but know someone who might be interested, please do let them know. 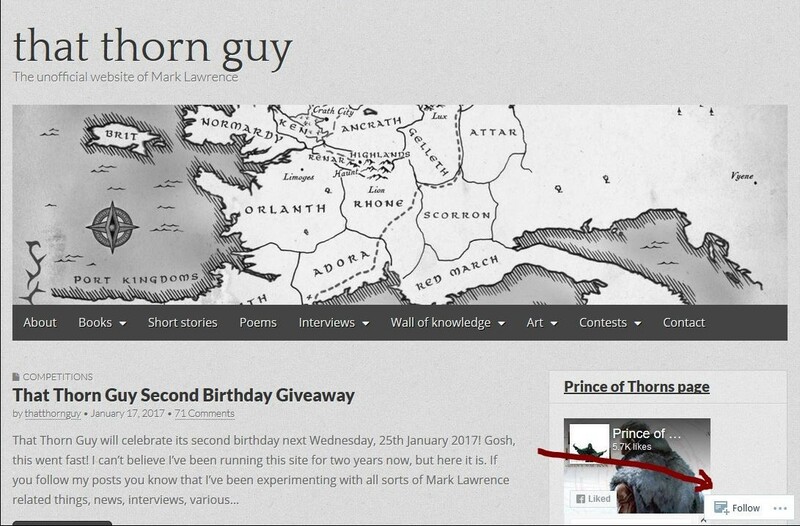 This is indeed a rare site, in fact I only know of one other reader-made fansite to an author, which is Westeros (a very long way to go for us! ), but I know that it’s as much the community around the website as the creator which keeps it going and makes it great. A few people have asked me recently how to subscribe to the site. To receive an email every time there’s a new post (which is about 1-2 times a month) look for the ‘follow’ option in the right bottom corner of your screen. If you click on that and type in your email address you should receive an email which allows you to follow the site after confirmation. Please let me know if it’s not working for you for some reason. Thanks again for your support. The three randomly selected winners this time are: Natasha, Gavin H and Chris Horrocks. Congratulations to the victorious three!